Every year when April 1st rolls around there is a popular joke people like to play on their friends and family members. It is usually done over social media. You know the one, right? The “fake pregnancy announcement joke”. For those in the TTC (trying to conceive) community and for our loved ones who know better- that joke can come across as insensitive and hurtful. Today I want to share why I think it’s not funny to pull the “I’m pregnant”joke on April Fool’s Day– or any day for that matter. I am in no way speaking for the entire infertility community, but I do speak for myself and I think it might represent what someone else feels, too. I have been in this boat for almost eleven years. 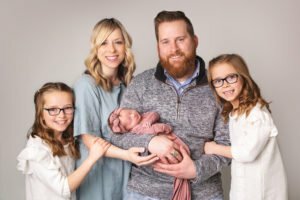 I have felt the ups and downs that come along with infertility. I have felt at peace with it, and I have felt broken by it. I have gotten pregnant, and had babies, and I have felt the emptiness that comes with wanting more. Why should you not “joke” about pregnancy? Why does it “hurt” someone else? When you are struggling with infertility- or miscarriage or infant loss- you experience many triggers that take you to a sad or hard place. You will have good days and bad days, and just as with PTSD, or other traumas, something might hit you out of no where that sends you into a spiral. I would venture to say that for most everyone who cannot get pregnant or has had failed fertility treatments- seeing pregnancy announcements can be trigger. I have to add this disclaimer: this is not to say we don’t love our friends and family members who are pregnant- because we do. Because at the very least- pregnancy announcements can tug at the heart. It reminds you of what you want and can’t have, or what you’ve lost. And for a split second your heart crumbles. For some, that’s all it is. Then they can pick themselves up and move on and be happy. For some- depending on where they are at on their journey- it is a trigger that can be so, so hard. It might send someone into a fit of tears, or feelings of agony and despair (might I add that sometimes these feelings cannot be helped, it is a knee-jerk reaction that happens with no warning) ; it could send all sorts of feelings through your mind and body. Feelings of jealousy, anger and bitterness. You might feel sad, and wonder why? Why them and not me? It’s awful to add guilt for feeling jealous, or angry for “nothing”. It can be hard to come back from that “place” and get back to normal. Once you’ve been hit with a trigger, or experienced such emotional pain, it is hard to snap back easily. Someone’s “joke” could quite easily send someone into a sadness or funk that lasts days. For myself, after feeling sad after others announce pregnancy, I always eventually come to a place where I am okay and truly happy for them. But that has taken time, and it has gotten easier, then harder, then easier again. Even for the person who has truly gained peace with their situation- they might still remember the ache- and feel for their loved ones who are still in a hard place in their life. And seeing those announcements makes them ache for their friends and family. I read an opinion on Facebook where someone was appalled that people were asking others not to joke about this. She said “we need to not walk on egg shells” all the time. And while I agree to an extent (people will always be offended by something) I think there are just some things we don’t joke about. Infertility needs to be one of them. Would someone joke about having cancer? Or the death of a loved one? I really don’t think so. Studies have shown that people diagnosed with infertility feel the same depression, heartache and emotions as those with cancer. If you haven’t experienced infertility this may same like an exaggeration, but sadly, achingly, I know how true it is. That is why I am so passionate about sharing my story. And why I feel it so important to raise awareness and compassion. It is so common. And while we can’t be politically correct all the time, or avoid everything that hurts us, I think we can at least do what we can to “try” not to cause unnecessary pain for others. I firmly believe that when faced with whether to do something hurtful or unkind, we should all choose to just be a little more kind and to forgo doing something that might seem funny in the moment, and to choose compassion toward others instead.